The three speed settings on a normal VHS VCR simply control the speed of the tape with relation to the rotating drum. In SP mode, the tape is moving past the head at 1.31 linear inches per second (ips). In LP mode, it’s 0.66 ips, and in EP mode it is 0.44 ips. As the tape speed decreases, the bands on the tape get closer together, reducing the quality of the image but increasing the amount of material that fits on the tape. This is the worst mode to record in since you are putting lots of information in a compact area. In this mode the Audio and Video tracks overlap by one third, (see image below) leaving only one third of the track to remain clear. Good quality is the best you can expect with even the best recorders. In time the signals will degrade and bleed further into each other. The sound will become garbled and the pictures washed out or very soft. 100% better quality picture and sound over EP mode. The video and audio tracks are butted up against each other on the tape but do NOT overlap (see image below) and both signals are clear. In this mode you get very good to excellent quality picture and sound. There is a probability of signal bleed through after some time. One major problem with LP is tracking from VCR to VCR. It may work perfectly in one VCR but not even track in another. About 15% better quality picture and sound over the LP mode. In this mode there is a space between the audio and video tracks as they are laid down. The space ensures that even over time signal bleed is not a problem. 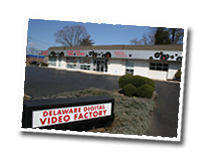 Delaware Digital Video Factory is Delaware's largest independent consumer video transfer and duplication facility. Our Wilmington retail location brings technology previously available only to businesses and professionals to the home video enthusiast. All work is performed on site (we do not outsource). Your original materials are handled with the utmost care and returned at the completion of the job. We'll let you know about our special events and offers.